Real Zama Penthouse for Sale in Tulum\r\r \r\rDo not miss this opportunity to purchase a beautiful two-bedroom condominium in Tulum, surrounded by nature and everything the Riviera Maya has to offer. New to the market is this cheerful 2-bedroom penthouse at Real Zama, located inside Tulum’s only master-planned gated community, Aldea Zama. A secure gated complex, Real Zama offers privacy to its privileged owners and guests. It has controlled access, private, manned security and off-street parking. There are just 24 units in the complex, all overlooking a lovely common pool, tropical landscaping and a lovely entertainment palapa.\r\rThis spacious condominium has over 2000 square feet of living space including a rooftop solarium. The penthouse apartment is a desirable end unit and offers an open living-dining area, which opens out through sliding glass doors to a lovely terrace. There are 2 spacious bedrooms with built-in closets and 2 full bathrooms. 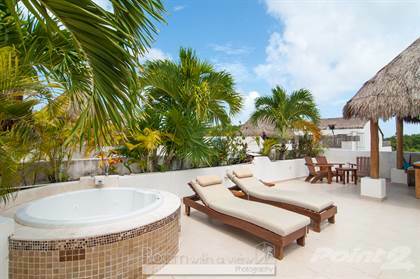 This space is very private with a Jacuzzi style tub, outdoor work kitchen area with sink and a shady palapa with fixed seating. There is plenty of room for sun bathing and dining. It is sure to be your favorite hiding spot! All finishes and furnishings are of top quality, and have been very well maintained. Each room is equipped with ceiling fans and air conditioning. Telmex supplies high-speed fiber optic internet. There is also off-street parking and a private bodega for storage of beach chairs, water toys, bicycles etc. While this vacation home has only been occupied by its original owners, given its location and amenities, the condominium is sure to be a great investment for those looking for ROI and vacation rental income potential.\r\rAldea Zama is an open community, inviting both permanent residents and visitors to enjoy superior services & exceptional living standards within a protected and respected natural environment. Walk or bike everywhere, as it is close to downtown markets, shops and restaurants, major grocery stores and the beach. Aldea Zama is located just 45 minutes south of Playa del Carmen and 1.5 hours from the International Airport in Cancun. This eco-friendly community is the perfect investment for the people who wish to responsibly capitalize on the growth of the Riviera Maya. With more than 3.5 million of visitors per year, Tulum continues to enjoy world-class tourism due to its geographic location. Aldea Zama offers residents and guests an exciting opportunity to become part of this global community, focusing on the integration and enjoyment of culture and nature alike.\r\rThis delightful penthouse is being offered for sale fully furnished and equipped and ready for immediate occupancy. This is your chance to have the penthouse of your dreams in Tulum, surrounded by nature and all that the Riviera Maya has to offer. Contact your Buyers representative today for more information about this beautiful vacation home. Ha Tulum- Region 15 !! Hi, I'd like to find out more information about Real Zamá Penthouse. Thanks so much!